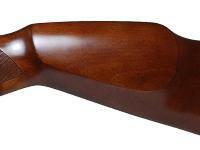 Wood stain on the stock and checkering may be lighter or darker than the above image. 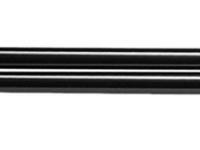 This Tech Force 87 Contender air rifle has the power and accuracy to compete with some of the most respected airguns in the world, yet its modest price makes it a perfect choice for virtually all shooters, competitors, small game hunters and backyard plinkers. The performance is truly amazing because it's capable of achieving muzzle velocities of 1100 fps in .177 caliber and 950 fps in .22 caliber. It packs a real punch, even at long range. 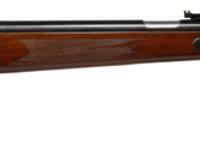 The accuracy surpasses many of the popular European air rifles that sell for two to three times the price. 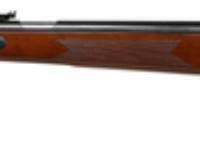 The fixed-barrel design has an underlever cocking mechanism with an anti-beartrap lock, automatic safety and adjustable trigger. 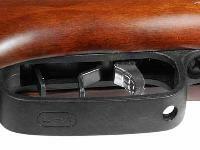 This rifle has fiber optic front and rear sights. 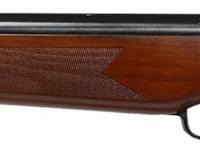 It comes standard with all the features that you would expect from a world-class rifle. It has a beautiful beech stock with a raised cheekpiece, checkering on the pistol grip and forearm, and soft rubber recoil pad. Things I liked: Nice wood. Shoots hard and with some adjusting sights in okay. Cocking effort moderate, but not hard. Nice bluing. Good saftey catch. For the money you get a pretty nice rifle. What others should know: Takes a little more time to safely load and shoot due to saftey catch, but worth the time. Better time than fingers. Can I get a video or manual to explain how to disassemble clean and reassemble the TF87?